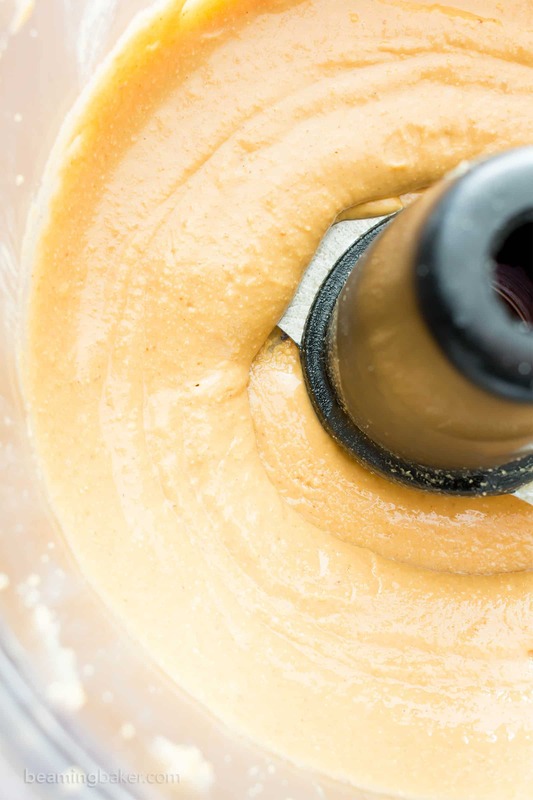 How to Make Homemade Peanut Butter: a step-by-step tutorial on how to make smooth, creamy homemade peanut butter. 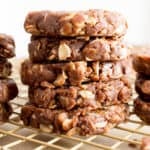 Vegan, Gluten-Free, Dairy-Free. Ah, silly me! But now we’re all ready to go. Btw, have you made peanut butter before? It’s a shockingly easy process that also does, in fact, include a bit of cleanup (blame the peanut oil for this one). 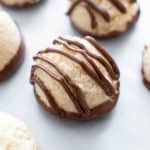 Peanut butter is super easy to make and seriously so delicious. More peanut-ty, in fact, than store-bought peanut butter. Are you ready to do this? Let’s get started! 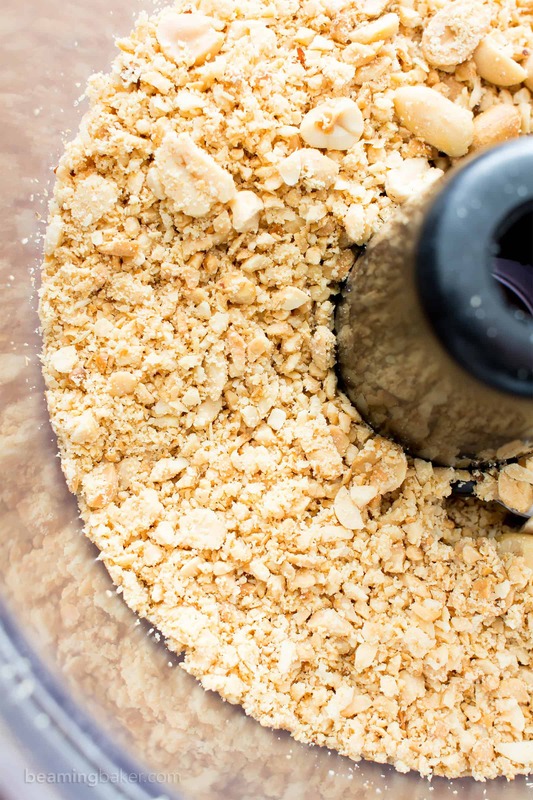 Add peanuts to a food processor or blender. I prefer using roasted, unsalted peanuts. The greater the roast, the deeper the flavor, and the darker the final peanut butter will be. Blend! Blend! Initially, the peanuts will turn into smaller, chopped up pieces. In this photo, you can see that there are still some whole peanuts. Remember to scrape down the sides of the processor. Now, the peanuts are starting to release oil. The peanut pieces are much smaller and beginning to stick together. A few minutes later, and a few scrapes down the side later, almost no large or medium pieces of peanuts remain. The remaining peanut pieces have been pulverized and have started to mix well with the peanut oil, creating a dough-like texture. An additional few minutes later, we’re almost there. 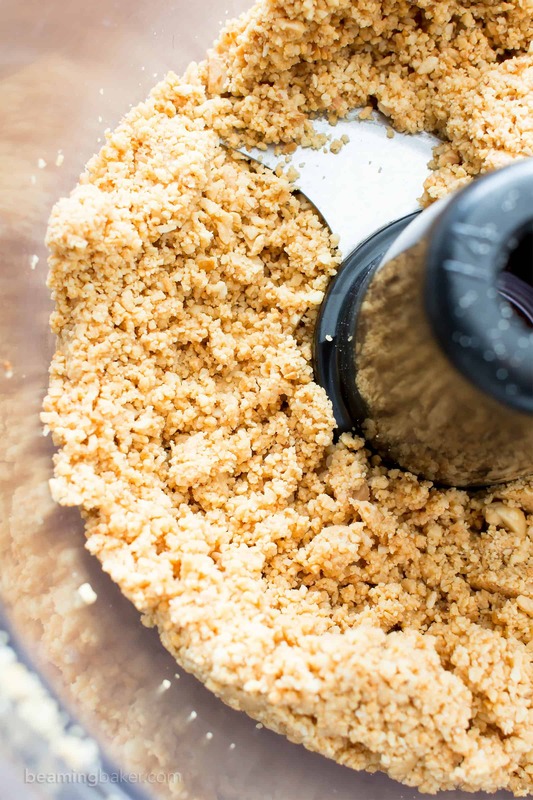 The dough-like balls of pulverized peanuts have been blended until more oil has released. It’s now turning into a liquid. However, there are still discernible chunks of peanuts still left. Blend until you get this ↑. Now you have peanut butter. The peanuts have turned into a liquidy, mostly smooth and spreadable delight. Enjoy! 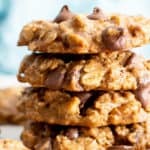 PEANUT BUTTER RECIPES to use your homemade peanut butter in! Who knew that would be so much fun? 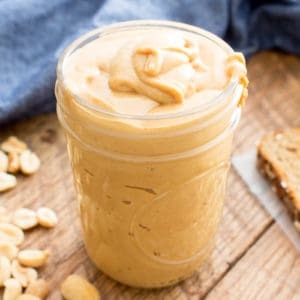 Let me know how your homemade peanut butter turns out and what you used it for! 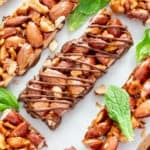 I might share some twists on this recipe. Comment or email me if you have a request! I can’t wait to see how yours turns out. 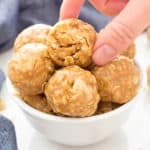 How to Make Homemade Peanut Butter: a step-by-step tutorial and video guide on how to make smooth, creamy homemade peanut butter. Vegan, Gluten-Free, Dairy-Free. 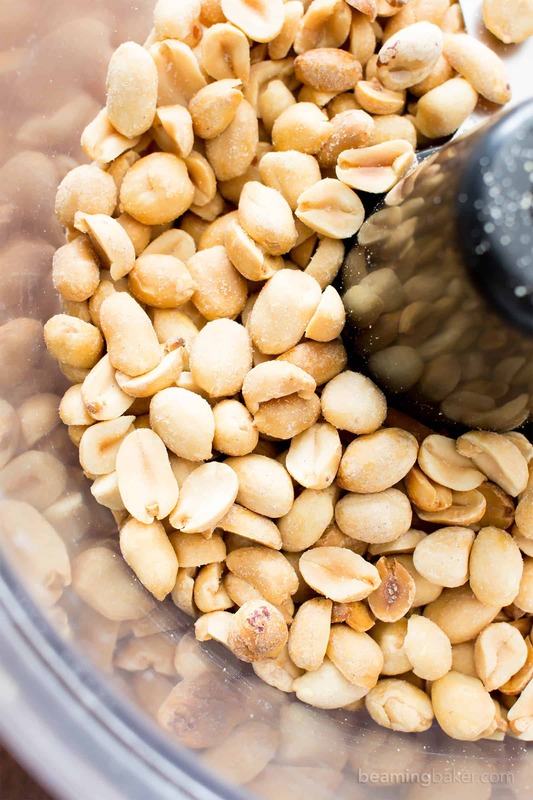 Add peanuts to a food processor or blender. Blend until coarse. Scrape down the sides of the processor as needed. Blend until mostly smooth, making sure to scrape the bottom of the processor or blender. 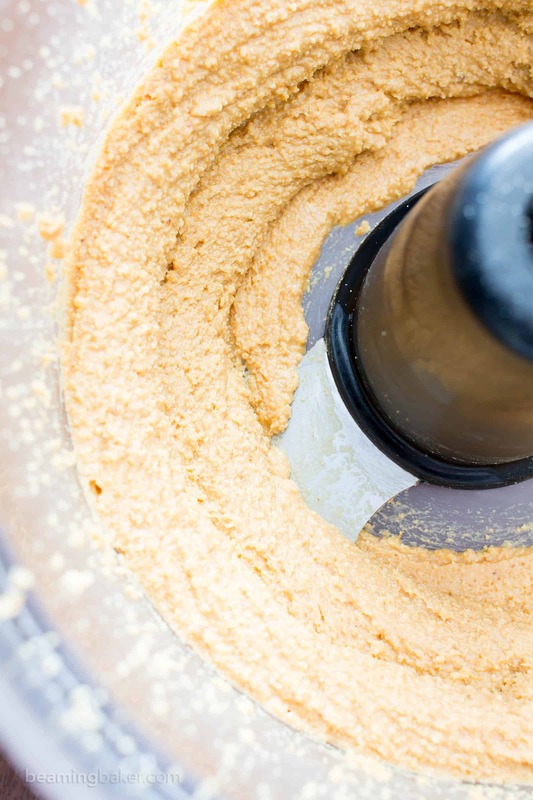 Blend longer if smoother peanut butter is desired; however, some graininess is normal. 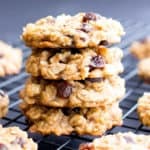 Enjoy as is, or use as needed in peanut butter recipes: no bake chocolate peanut butter oatmeal cookies, 3 ingredient peanut butter no bake energy bites, peanut butter chocolate chip breakfast bars. Storing instructions below! - Storage notes: Store in an airtight container, in a cool, dark environment, at room temperature for 2-3 months. Store in the refrigerator for 3-6 months. 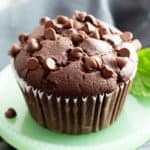 You made this recipe look so easy and so delicious. This peanut butter has the perfect consistency. Seriously I have been meaning to make peanut butter fro the longest time. You make it look so easy, and the photos are beautiful! I’m going to do it! It’s SO ridiculously easy! So happy that you’re gonna go for it! I love homemade peanut butter! Making it at home is easy and tastes so much better! It’s seriously the BEST. The flavor is amazing! 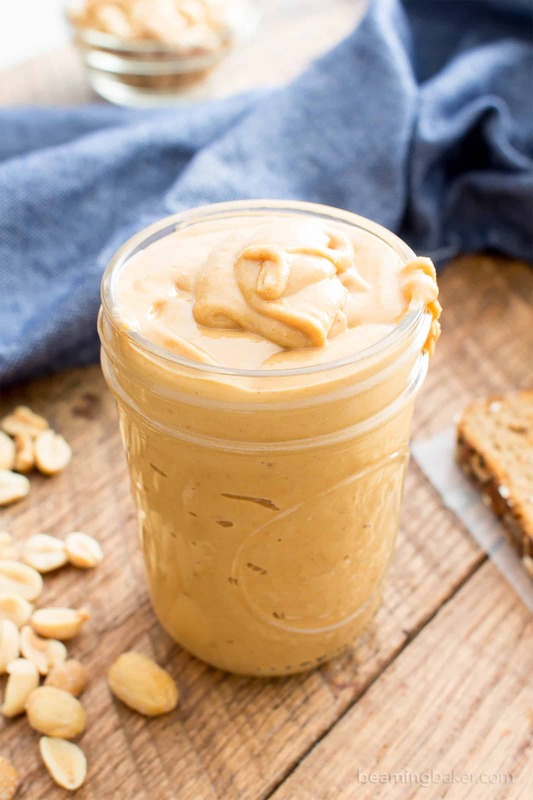 I can’t believe that making homemade peanut butter is that easy! I have a new processor that should be able to manage the peanuts so yay! Yes!! I couldn’t believe how easy it was either until I tried. I LOVE my processor and it handled making the PB very easily! 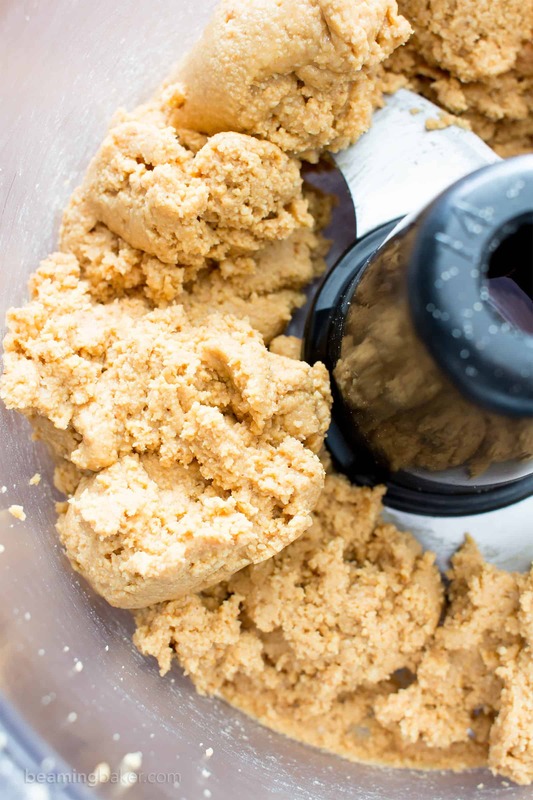 We just love making homemade peanut butter, so delicious and no nasty stuff! Oh my! I am in love with this. I can’t believe how easy it is to make at home. I’ve tried making it once before and what a disaster. You’ve made it sound so simple that I’m going to attempt it again, especially since I bought a regular-sized jar of organic peanut butter at wholefoods for $10! Thanks for posting!! Just curious how much peanut butter did this amount to? What size container/jar? My pleasure, Vicki! 🙂 It made about 1 to 1 1/4 cups— about the size of an 8oz mason jar (the small one with the wide mouth). Wow, it really is super easy! Can’t wait to try this! They’re SO easy to make. Can’t wait to hear what you think! Yum, this needs to happen ASAP!I’ve heard it’s better to store with the container upside down. Is that true? I can’t wait to try this!! Its Faaantastic!!! I have never made my own peanut butter! Can you believe that?! I bet it’s so much more delicious! Yes!!! Hehe. I went quite a while without making it myself. 😉 You’ve got to try it! I’ve truly seriously never thought making the peanut easily like that. It is really AWESOME ???????? like I just discovered a treasure lol!!!! I’m gonna try it asap! Thank you a lot!!! Right?? It’s SO easy! Treasure: Hehe. Totally!! Can’t wait to hear what you think! ???? This is a must-try! Definitely making this! I’m the gal that tried making peanut butter a while back with disastrous results. Just attempted again today and it came out exactly like your finished product! So easy and took just a few mins! The last time I tried I made it in my food processor and I guess it just didn’t have the power like my Vitamix does. Doing a happy dance since I no longer have to pay $10 at wholefoods for an organic pure peanut butter! Thanks!!! Hi Trish, yes, I remember! 🙂 Oh, I’m so happy to hear that it worked out! I’m doing the happy dance with you!!! 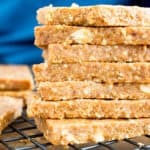 I love the idea of homemade peanut butter! It’s so simple, and definitely makes me feel better knowing that it is literally ONLY peanuts inside my jar. Not like the store bought stuff. Absolutely doing this! Yes! 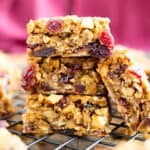 It’s so easy to make and it’s truly amazing knowing exactly what’s in it! Does it have to be refrigerated or is it ok in a jar in a cupboard? I tried making my own peanut butter. 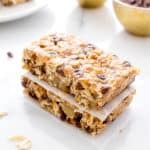 the texture is very thick, almost like your no-bake peanut butter energy bites. what is wrong? Did you get a chance to follow along with the step by step photos? Were you perhaps still in Step Four (see pics)? That stage is where the peanut butter turns into a semi-wet dough. Keep blending until it breaks down into a very liquidy texture. Good luck! I went looking for roasted peanuts and found two kinds…dry roasted and roasted with added peanut oil. Which one would be best? Thank you for blogging about good food! Hi Maria! Thank you. 🙂 Try the dry roasted one. Hope you enjoy!! Hugs! Where do you buy your peanuts? Do you buy them in bulk from somewhere? Hi Olivia! I usually buy my peanuts from either Whole Foods or Trader Joe’s. Hope this helps!